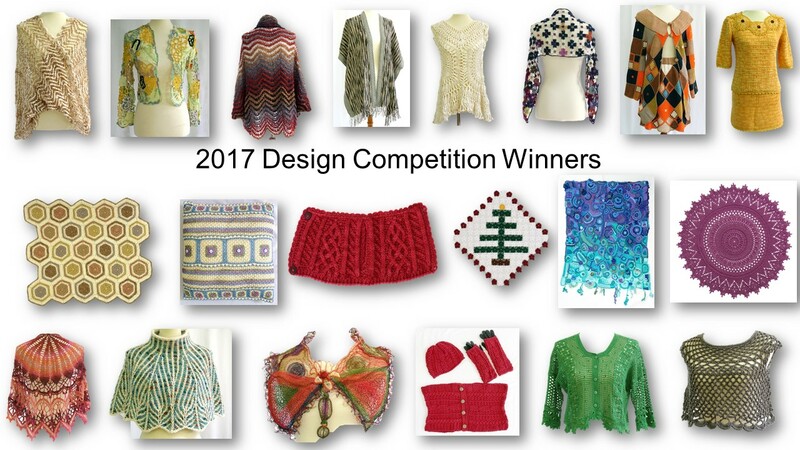 I'm Marie from Underground Crafter and I'm here to share a roundup of seasonal crochet patterns designed by Crochet Guild of America members. This month's theme is a summer gathering because there are so many of those to look forward to in the summertime. 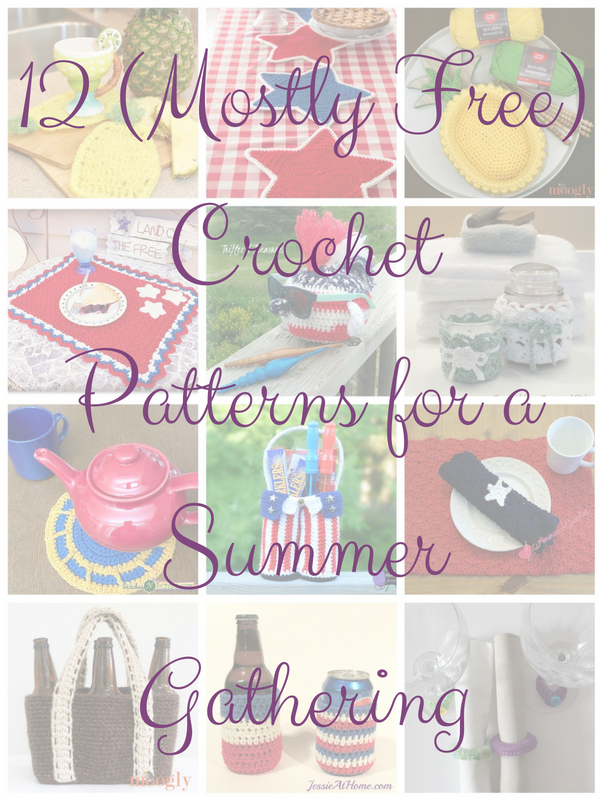 This roundup includes patterns for baskets, place settings, cozies, and more. All images are © the respective designer or publisher and are used with permission. Pineapple Scrubby Dishcloth, free crochet pattern by The Purple Poncho for Red Heart: This textured dishcloth is perfect for cleaning up after the party. 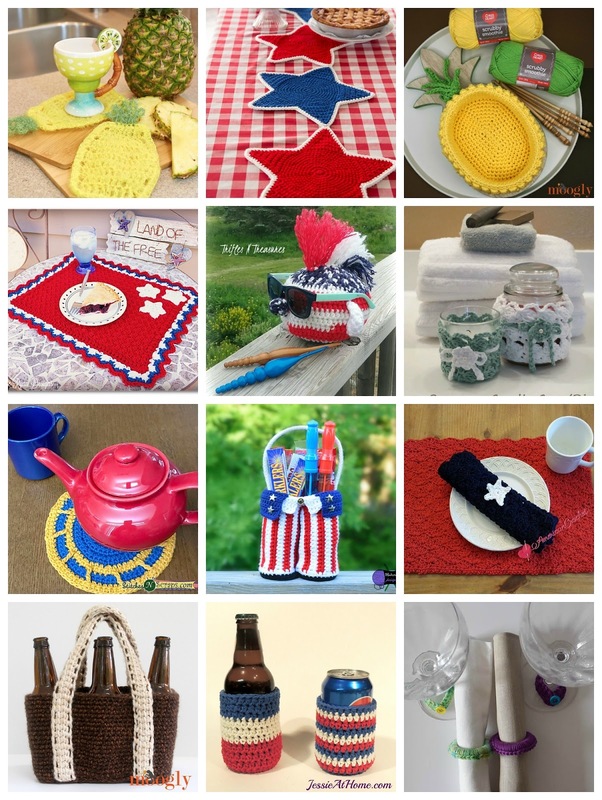 Patriotic Summertime Placemat, free crochet pattern by Beatrice Ryan Designs: This red, white, and blue placemat would be a great fit at a Fourth of July barbecue. Reinventing the Wheel, free crochet pattern by StitchesNScraps: This trivet is perfect for resting your hot plates. Bring Your Own Bag, free crochet pattern by Moogly: This bag can carry a six pack of any glass bottled beverage. Americana Star Table Runner, free crochet pattern by Cristin Berrafato for Red Heart: This star motif project would add a vibrant touch to any table. I Am Sam Glasses Holder, free crochet pattern by Trifles N Treasures: This whimsical little amigurumi character is perfect for keeping your sunglasses safe when you switch to your night glasses. Patriotic Pants Gift Basket, premium crochet pattern by Blackstone Designs: Pack a host(ess) gift for your next summer party in this unique gift basket. Striped Can Cozy, free crochet pattern by Jessie At Home: This simple project is great for keeping condensation from bottled or canned drinks from staining furniture. Pineapple Basket, free crochet pattern by Moogly: This basket has a plastic canvas base to make it sturdy. Seascapes Candle Cozy, free crochet pattern by Crochet Memories: This lacy candle cozy would add a romantic touch to an outdoor dinner. Picnic Pocket Napkin, free crochet pattern by American Crochet: This napkin has a pocket for cutlery. Girls’ Night In Napkin Rings and Wine Glass “Charms,” free crochet pattern by Underground Crafter: These scrap busting projects are perfect for dinner with drinks. I hope you enjoyed this roundup! You can find more project inspiration on my Crochet for Home Pinterest Board. Section 2 of the Breath of Life shawl has been added to the pattern! If you're just joining us you can get all the info about the CAL, including a complete schedule and links to previous posts HERE. This week you'll be working on section 2, which is a different stitch pattern. We will finish our crocheting, then next week we'll do all the finishing. Head over to the Breath of Life pattern for the CAL instructions. The 2018 CGOA Chain Link Conference is fast approaching and I can’t wait! This year will be the fifth conference I have attended since I joined CGOA five years ago. What keeps me coming back year after year…the classes, the inspiration, the friendship possibilities, and the always-spectacular marketplace. 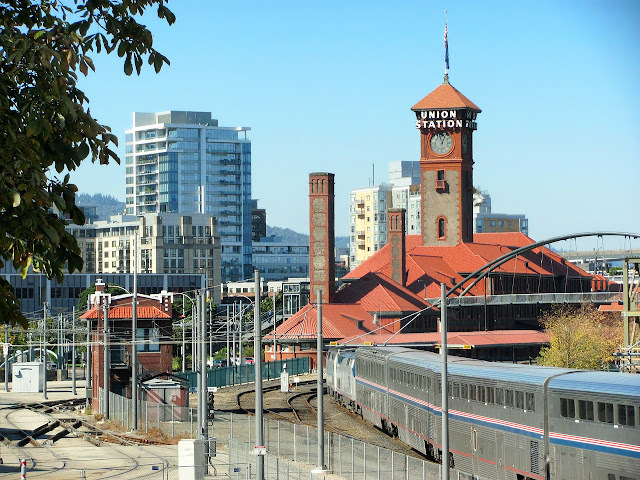 A huge bonus…the location of this years’ conference – Portland, OR. Whether you are a beginner or an intermediate/expert crocheter…extrovert or introvert…you will find the conference to be a great experience. When not in classes, why not check out the MARKETPLACE? For attendees, there is a preview on Thursday evening so you can check it out before it opens to the public. The Marketplace is open to everyone Friday and Saturday from 10 am to 6 pm/5 pm. Plenty of time to get in some shopping between visiting with friends, attending classes, and checking out the area. Welcome back to the Breath of Life shawl crochet-a-long! If you're just joining us you can get all the info about the CAL, including a complete schedule and links to previous posts HERE. This week you'll be working the first section of the shawl. Section 1 uses your first yarn choice and will have 4 rows to learn. Once you get the hang of the pattern you'll be able to do it without the instructions. Head over to the Breath of Life shawl pattern for the CAL instructions. 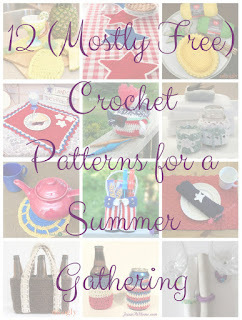 It's late spring, technically almost summer, so it's time for a new crochet-a-long! 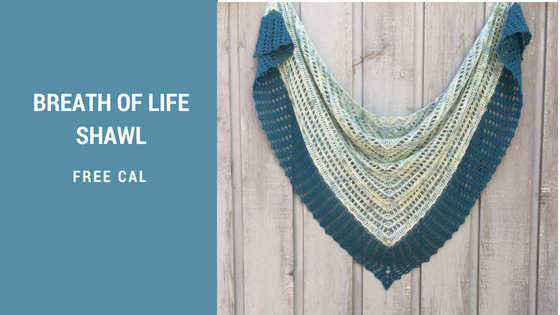 The Breath of Life shawl will be a free CAL hosted here, with the instructions over at Ambassador Crochet. It is a fairly quick project so you will be able to wear your new shawl in a couple weeks. It's finally here! The Breath of Life Shawl is a lightweight shawl, perfect for spring or summer temps. It is worked with simple stitch combinations that create an eye catching design. Today's section will include a materials list, gauge, special stitches, as well as dates. Head over to the Breath of Life Shawl post for yarn info, gauge swatch, and more. Don't forget to join the fun in our CGOA CAL group on Facebook. You can ask questions, connect with others working on the CAL, see project photos, and more. If you want to share photos of your work, please use hashtag #CGOACals - we'd love to see your projects.